It's 100 degrees in Texas, and I decided to make Rack of Lamb. Not exactly a summer dish, but I had never made it before, and I was curious. Check out Gordon Ramsey's video of Herb Crusted Rack of Lamb. I didn't follow this recipe at all. Not even 1%. 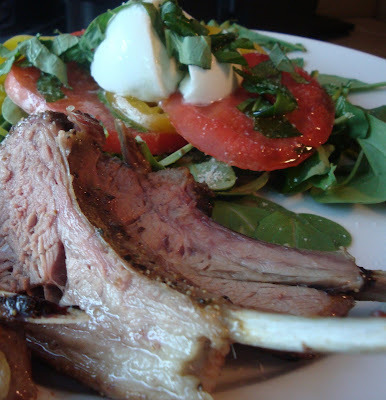 I opted for an extremely simple version of rack of lamb, and it turned out delicious. I served with a summery caprese salad, and called it a success. You basically just put it in a pan and cook. Give it a try. Rack of Lamb 1. Season lamb generously with salt, pepper and any lemon/pepper seasoning that you have in your cupboards. 2. Place directly in shallow baking pan, fat side up. (This allows the fat to flavor the lamb all the way through.) 3. Place in preheated oven at 300 degrees, and cook for 1 hour. Or until internal temperature reaches 150 degrees. 4. Remove from heat. Loosely tent with foil and let rest for 10 minutes. This allows the juices to remain in the lamb. 5. Fat side up, slice in between each rib, and serve 3-4 pieces per plate.